Two-thirds of Americans favor an end to the decades-long U.S. trade embargo on Cuba, a January Pew Research Center study found, and the two nations reportedly are making progress on re-establishing diplomatic relations. As the communist government continues to slowly reform Cuba’s economy, American businesses – from airlines to law firms – are exploring commercial opportunities on the island nation. But even if the embargo were to be lifted, it’s not clear just what sort of Cuban economy those businesses would find. Getting a handle on even basic information about Cuba’s economy is difficult, for a number of reasons. The government still dominates economic activity on the island, both directly and through heavily subsidized state-owned enterprises. National statistics are not always complete or reliable. And Cuba’s system of two parallel currencies – one peso for everyday transactions among ordinary Cubans, and a “convertible peso” for the tourism industry, foreign trade and the private sector – combined with multiple exchange rates complicates any international comparisons or discussions about the relative size of different parts of the economy. According to a survey conducted in March and published in The Washington Post, 79% of Cubans said they were dissatisfied with the country’s economic system; 70% said they wanted to start their own business. Nearly two-thirds of Cubans (64%) said normalizing relations with the U.S. would change the economic system, though only 37% thought the political system would change. With so much change in the air, we decided to work our way as best we could through the data difficulties to put together a primer on what we know, and don’t know, about the Cuban economy. 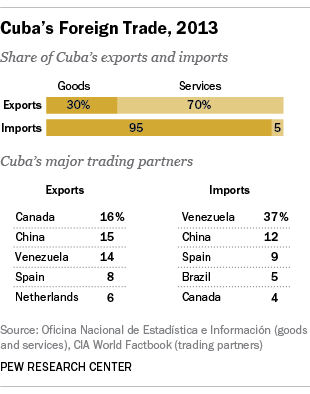 1Despite the embargo, the U.S. does do business with Cuba. Last year, according to the Census Bureau, the U.S. exported nearly $300 million worth of products to Cuba; nearly all (96.2%) of that was in the form of meat and poultry, soybeans, corn, animal feed and other foodstuffs. The exports are permitted under a 2000 law that modified, but did not repeal, the U.S. embargo; under it, Cuba can buy certain agricultural products, medicines and medical devices from the U.S., but must pay in cash. 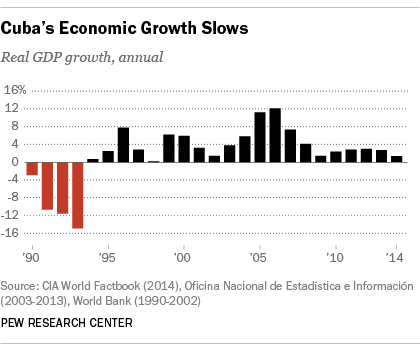 2Growth has slowed sharply in recent years. According to Cuba’s national statistical agency, the country’s gross domestic product in 2013 was 77.2 billion pesos – which, depending on which exchange rate one uses, could equate to anything from $77.2 billion (at the official rate of 1 convertible peso to $1) to $3.2 billion (at the internal rate of 24 regular pesos to 1 convertible peso). But either way, growth has slowed dramatically from the mid-2000s: The CIA estimates that Cuba’s GDP grew just 1.3% last year in real (inflation-adjusted) terms – 177th out of 222 countries ranked. One big reason: With global oil prices still well below their pre-recession highs, the heavily discounted oil that Venezuela sends Cuba – some of which Cuba re-exports – is less valuable. 4More Cubans are working for themselves. In 2013, according to state figures, more than 424,000 Cubans (8.6% of all workers) were classified as self-employed; as recently as 2009, fewer than 144,000 Cubans (2.8%) were. The “microenterprise” sector may be even bigger due to the hiring of unregistered full- and part-time workers. Ted Henken and Archibald Ritter, researchers at Baruch College and Carleton University, respectively, estimate that as many as half of small enterprises employ at least one unregistered worker. 5 Cuba mostly imports goods and exports services. Getting a clear read on Cuban trade is especially tricky, not least because exports and imports are effectively valued using different exchange rates. 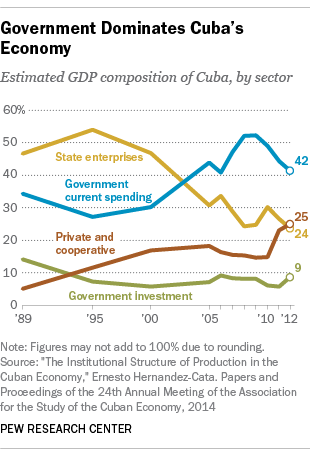 As The Economist recently explained, state-owned firms and foreign joint ventures value each ordinary peso at one convertible peso – that is, at $1: “The massively overvalued rate … creates huge distortions in the economy, allowing importers to buy a dollar’s-worth of goods for one peso.” While most of Cuba’s exports are in the form of services (such as doctors and teacher working overseas), nearly all of its imports are goods (petroleum, foodstuffs, machinery and equipment, and chemicals).